Back in 1990 the Dutch government producted a masterplan for cycling, which included this video produced in English and sent around to world (including Polish subtitles in this example) to let everyone know what their intentions were so far as cycling was concerned. The Masterplan contains estimates of what it was hoped would be achieved by 2010, and it appears that they're going to be successful in meeting the targets. Very many areas of the world don't have examples of infrastructure such as you'll see in this 18 year old video. Very much of it here has of course been improved once again since the video was made. It's a great example of joined up thinking. The cycling rate here has not come about by accident. It's the result of a consistent policy stretching over decades and concentrating on making conditions for cycling attractive. By way of contrast, the UK had a "National Cycling Strategy" in 1996 which had an aim of doubling cycling by 2002 and doubling again by 2012. It was abandoned in 2004 after the rate of cycling had declined over the previous 8 years - just one of many times that promises have been broken. The very consistency of the Dutch approach is a large part of the reason for its huge success. For more information, we have many articles about cycling in the Netherlands on our website, including the Master Plan from 1999. Another event in Assen yesterday was the Winter Triathlon. There were about a thousand competitors, either as individuals or in teams for a "relay". Most people took part in a 10 km run, a 50 km cycle ride and 20 km on ice skates, but there were also sprint events where the distances were halved. Ages ranged from 20s to 70s. I'm a hopeless runner and can't skate, so triathlon isn't really my thing, but I went to watch for a bit. The cycling and running events involved the police being out in force closing roads. It seems relatively easy to get road closures here compared with back in the UK. Last night was the "Nacht van de Nacht" - "Night of the night." It's a campaign about light pollution, which has effects on night time animals and of course makes life difficult for astronomers. Various activities were organised around the country. Here in Assen we had a choice of a walk in the woods or a bike ride. A couple of dozen people turned up for the bike ride, which covered about 10 km over an hour, including lots of stops. It was lead by a council employee who showed off the new initiatives in street lighting. Assen is aiming to be "carbon neutral" by 2020. As part of this effort the council is installing lower energy LED street lighting across the city. These produce more light per watt of electricity, and are more directional meaning that less is scattered across the sky (meaning that yet more of a reduction in consumption is possible). They cost money to install, but over time, they save a lot of money and a lot of CO2 production. There are further innovations. While most of the lighting is white, there are also plans to install green lighting in some places. These can be even lower in energy consumption because the human eye is most sensitive to green light. There was also talk of an idea where lights would dim and brighten depending on the state of an infra-red sensor on the pole. This means that energy could be saved due to the light being dimmed on the bike path where there are no people, but that the lighting would be bright as you approach and dim again after you've passed. All of these things also benefit wildlife and make life better for astronomers. We also saw solar powered lamps by cycle parking. While it costs around a thousand Euros to put in a normal pole, vs 2100 for a solar pole, no electricity supply has to be wired up, which can be expensive to do (a long time ago in another life I was involved in the preliminary design of some solar powered street furniture and we found it could work out cheaper than wiring to the mains). As ever there was also talk of safety. Social safety for cyclists and pedestrians is improved by having good lighting. If you want people to cycle you have to provide decent street lights. All of these things also benefit wildlife and make life better for astronomers. Given the number of advantages, it would seem rather silly not to be making these changes. The tour ended up with avery welcome cup of hot chocolate and a slice of cake. Assen, and the Netherlands in general, has a lot of environmental innovation which I've not seen in other places I've lived. I've written up some of it before. In the 1970s on British TV there was a series called "Van der Valk" which followed a Dutch policeman from week to week. The show was made in English and I understand that the actors were all English too. However, it was shot in Amsterdam. The interesting thing about this video, which shows the opening credits, is that having been shot in the early 1970s, it shows a different Amsterdam to that which you'll see in the present day. There are fewer bikes, and lots of cars. Dutch cities just don't look like this any more. See also some before and after photos of Assen in the 1970s vs. now. Yes, 40% of US urban travel distances are < 2 miles. Just like elsewhere, most trips are short. I first heard of the Clif Bar 2 mile challenge some time ago. My first reaction was that it was quite ludicrous. 2 miles (3.2 km) is such a very short distance to travel on a bike, yet here's a website showing you how to do it, what equipment to buy (there seems to be an awful lot of it) etc. Surely no encouragement should be needed to get people to make such short journeys by bike ? And why the involvement of an energy bar manufacturer ? Surely no extra energy is needed after that short distance. However, let's look at it in its context. They claim that 40% of all urban journeys made in the US are 2 miles and under, and that 90% of those trips are by car. I dare say that these figures are correct. Average journey distances are much the same in any country, the US and the UK having similar figures to the Netherlands. However, choices of travel mode in the Netherlands are a bit different. In this country, 35% of journeys up to five miles (7.5 km) are by bike, 26% by foot and 23% as a car driver. That's for the entire country including rural areas. You get more cycle usage (and walking) in urban areas and over shorter distances. The Dutch also make 15% of their 7.5 km - 15 km journeys by bike and 3% of their over 15 km journeys. i.e. The Dutch make at least three times as many over 15 km journeys by bike as Americans manage over any distance including the shortest. Clif Bar are right to think there is some room for improvement in the USA and it would be a good thing if they could manage to get people to change their habits, even just once a week. A year or so ago, Kelloggs set a similar challenge in the UK. In their case it is a ten mile challenge (16 kilometres). That's the distance that your family is challenged to jointly ride their bikes in a week. Families which manage this awesome feat can win a new bike (though dare I say it's unlikely they've worn out their old ones...). Again, it seems absurd when viewed from a country where every man, woman and child cycles an average of 2.5 km per day every day of their lives. Kelloggs had an offer with the same cycle computers in the Netherlands, but they wisely didn't bother with asking people to cycle 16 kilometres. It would be easy to be cynical about the reasons why both these companies are involved, but I believe both are genuine attempts to raise awareness. These two challenges are far from alone. There have been many such initiatives in the US and UK, but none of them achieve anything much by way of changing the appallingly low rate of cycle use in those countries. Perhaps this is because none of them actually address the issues which stop people cycling in the first place. A "challenge" is not what's required. What is required is conditions for cyclists which make cycling an attractive thing to do. If cycling was less pleasant in the Netherlands, then fewer people would cycle here too. However, cycling is both safe and convenient here and the public has responded by cycling more than in any other country. With good enough conditions, cycling largely promotes itself. The same thing could be achieved anywhere, but it takes a similar dedication to building a truly excellent environment for cycling that the Dutch have demonstrated for the last few decades. If you want to see what it's like over here yourself, we can show you. From a distance, there's not much to see. Most of the cycle-parking at Groningen's central station has been hidden from view. In 2006, Groningen replaced the cycle parking which had been an untidy clump of bikes outside the station with a remarkable new cycle park which has space for 4150 bikes under cover outside the station. It stretches between the two wings shown in the photo from the left side right past the right side of the photo. Along with the old two storey cycle park just around the corner and the 1500 or so spaces in the indoor, watched cycle parking in the newer looking building on the left of the photo, this brings the total number of spaces for bikes to around 6000. The population is about 180000, so there is space for about one in thirty people to have a bike at the station at any one time. On top of the cycle park, there are now seats and a sculpture, and the whole thing looks really rather nice compared to the untidiness of the previous situation, which in any case had fewer places and didn't have the bikes undercover. Here's my video showing cycling through the cycle park. You don't see any bike twice in the video as we take two different routes. You also don't see anything like all the bikes, as there are different ways through. This new cycle park cost €10M to build. Of course, as with all cycle parking, it's permanently full. So there are also a lot of bikes parked around this cycle park. It is estimated that there are frequently over 6000 bikes in the 4150 official spaces of the new cycle park. And note that in 2010, Cycle parking at this station was again increased. Nearly 60% of all journeys are made by bicycle in Groningen - a higher rate than anywhere else in the world. The city is 30 km North of Assen and it's featured on both our Study Tours and Cycling Holidays. There are also several more posts showing Groningen. I've noticed a tendency for people living in other countries to be dismissive of the rate of how much cycling there is in the Netherlands on the grounds that "it's a flat country, so easy to cycle". In fact, living in a flat country means living with headwinds. Strong headwinds. I've cycled both in places with hills and in flat areas with strong headwinds. It's easier with hills. Hills don't go on for ever - after climbing a hill you get to ride back down the other side. If you're lucky enough to have rolling hills you can get part way up the next one with the speed you gain on the previous downhill. Excellent fun. On the other hand, once you start into a headwind you're generally stuck with it. Possibly for the rest of the day if you're touring. The Dutch recognise this problem. You find a lot of upright omafietsen (granny bikes) are fitted with tri-bars. This applies even to omafietsen ridden by actual grannies (though the example in the photo is actually a rather upmarket machine ridden by a genuine grandad). It initially looked to me like a bizarre combination, but it's quite practical. It's got nothing to do with pretending to be in a time trial and everything to do with a practical desire to minimise one's frontal area to go into headwinds with a little less effort. One of the Dutch readers of my blog, Anneke, commented on a recent post that on her 16 km round trip to school each day she could "remember riding in a flock of school kids and arguing about who had to ride in front facing the strong winds." To summarize, if flatness was all that mattered you'd expect that areas of the UK such as Lincolnshire, Cambridgeshire and Somerset would have a similar rate of journeys by cycle as the Netherlands. They don't. Not even the parts which are called 'Holland'. The problem is the lack of subjective safety. Riding on roads, sometimes with hostile motorists, does not make for a cycling experience which is pleasant enough for everyone to want to cycle. 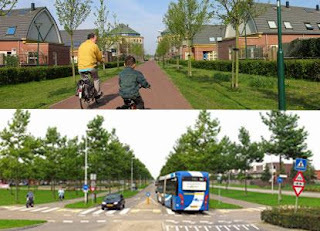 This is what is so different in the Netherlands and the reason for the high rate of cycling here. What's more, Switzerland has a higher cycling rate than any English speaking country, and it's anything but flat. So, can we please stop making this excuse about hills ? I went to Trondheim in Norway this year. It's a very hilly city. In fact, it's the only city in the world where a permanent mechanical lift has been installed to help cyclists climb a hill. Trondheim is also a very cold place in winter. Nevertheless, Trondheim is investing heavily in cycling and plans to double its existing 8% cycling modal share in the next few years. To grow cycling, investing in good cycling facilities. Nothing else has the same effect. We organise cycling holidays in the Netherlands - when possible we take into account the wind direction. Some things in cycling never change. “I thought it only right to give it a fair trial,” he answered. I said: “You gave your family a fair trial also; if you will allow me the use of slang. Your wife told me that never in the whole course of your married life had she known you so bad tempered, so un-Christian like, as you were that month." The book is well out of copyright and can be downloaded for free. The text is available from Project Gutenberg amongst other places. Alternatively, why not buy a copy. It's a thin book ideal for reading on a cycling holiday. It's one of a small number of cycling books that I think are well worth reading and if you're going to buy it you could do worse than the very inexpensive copy on our website amazon shop. The picture is one of those by L Raven Hill which illustrates the book. It's of "The Overhauling Fiend". Those who have read the book will realise he's another character who is still with us. 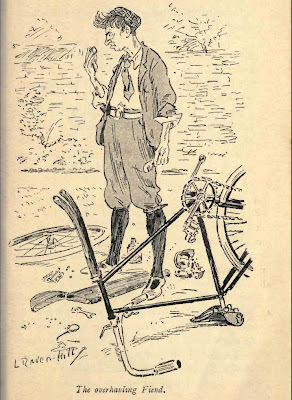 Before Three Men on the Bummel, the same Author wrote the more well know Three Men in a Boat. Also a wonderful book, but with fewer bikes in it. My wife suggests not reading either of these books on public transport as laughing out loud attracts too much attention. Last Saturday afternoon, Terry and I cycled from Assen to Groningen on folding bikes and returned by train. Terry's is a Brompton, while I have a cheap bicycles4u folder. It's not really in the same class, but given that I don't need a folding bike often it's pretty good. It did just fine for this 40 km ride. As is usually the case in the Netherlands, most of the distance was covered on either cycle paths away from the road or roads closed to cars. The route is one of those possible on the cycling holidays we organise in this area. We used to live in Cambridge in the UK. While there is a low rate of cycling by Dutch standards, this city has the highest rate of cycling in the English speaking world. Unfortunately, they don't pay much attention to what it would take to increase subjective safety to the level where everyone will cycle, and as the results of a poll in the local paper ("Do you think cycling through Cambridge is dangerous?") show, it's a place where many people don't feel safe to cycle. 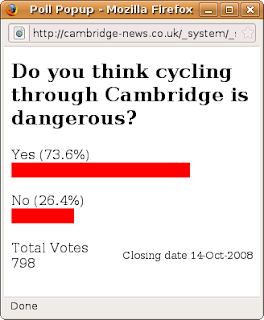 The poll was linked to an article that the Cambridge Evening News ran yesterday about a dangerous set of road works in the city which have been causing problems for cyclists for months. I wonder how many people have given up cycling across this busy bridge as a result of the works ? Cyclists are given no choice but to ride in front of cars using the restrictions and are being hassled by drivers as they cross the bridge. The bridge is steep enough to cause many cyclists to slow quite considerably, increasing the conflict caused by this arrangement. I can't imagine such designed in conflict being a feature of road works in this country. I've pointed out before, on the Cambridge Cycling Campaign website amongst other places that road works here reduce conflict with cyclists in order to make sure that cyclists keep on cycling (that was five different links to five different examples), even if it means having to put up temporary bridges which maintain cycle routes while the usual route is cut off due to works. If the intention is to maintain and perhaps grow a cycling culture, it's really no good to let people get hassled off the road. It's not unique, of course. There is a past history of road works in Cambridge causing problems for cyclists, and of new developments leaving a mess behind. We organise study tours on which we show off the excellent infrastructure in the Netherlands. Where there are road works you'll not see cyclists pushed into dangerous positions. You'll also see an awful lot of cyclists because very few people feel that cycling is unsafe here. It isn't only in the Netherlands that subjective safety matters. Here it's been dealt with to a greater extent than in most other countries. People already cycle in large numbers. It's a rather bigger problem in English speaking countries which have amongst the lowest levels of cycling, and the lowest levels of both subjective and actual safety for cyclists. The huge numbers that turn out for one day only events like London's Freewheel demonstrate how safer conditions create cyclists. How people will cycle if the surroundings are pleasant enough. However, single day events don't give an opportunity for people to grow a habit of cycling. There are a number of responses to the lack of subjective safety in the English speaking world. Things that people do in an attempt to increase their subjective and actual safety for at least a part of some of their journeys. Often cyclists make use of relatively indirect back roads (making journeys slower and less direct than they would be in the Netherlands where you can take direct routes without fear for your safety). Cyclists wear fluorescent clothing and can get quite obsessive about lighting because they fear they won't be seen. Helmets are common due to a perception than it makes cycling safer. Occasionally there are organised efforts such as the "bike bus" in Sydney, Australia. This gives an improvement in the level of subjective safety felt by a cyclist riding alone on hostile streets. It's great if they get people to cycle, however, the existence of such a thing is symptomatic of a problem. The people using the "bike bus" don't feel safe enough to ride on their own, and even in the "bike bus" they don't feel safe enough to do away with helmets and fluorescents. Many more people will remain unconvinced that it's safe even with a "bike bus". Ultimately this is the wrong approach. If cities in English speaking countries (Sydney included) had proper cycling infrastructure which made cyclists feel safe and improved the efficiency of their journeys, there would be no such thing as a bike bus. There would also be a much higher rate of cycling in the much more attractive conditions, people wouldn't feel the need to wear protective clothing, and the injury rate would fall. The English speaking world needs to start looking for advice not amongst other English speaking countries, but to those countries where cycling is truly a part of everyday life. The Netherlands leads in this and Denmark is in second place. This is where you find the experts who have proven success in raising rates of cycling. Via Amsterdamize, a story which shows that Australia is perhaps also starting to do the right thing. Let's hope it is successful. We organise Study Tours in the Netherlands for campaigners, planners and others interested in experiencing for themselves the highest quality cycling infrastructure in the world. The Dutch cycling experts group is the Fietsberaad. I've argued in the past that increasing the subjective safety of cyclists is probably the most important thing that can be done to increase cycling. I'm sticking with this. It's easily the biggest difference in the experience of cycling here vs. the UK, and it's pretty obvious which place has most cycling. It isn't only in cycling that subjective safety is important. The motor vehicle industry has for many years touted the safety of their products. 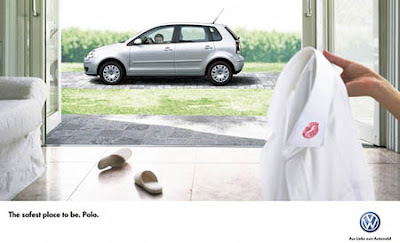 For instance in the very clever Volkswagen ad shown here. Never mind that a comparable number of people were killed by motor vehicles during the 20th century as in all the wars combined, the message is always that cars are safe. They've also managed to make people think that bigger and more expensive cars are safer, even if it's not always true. The airline industry is even better at it. It's hardly surprising that many people have a fear of flying. There can be few things more unnatural, or a more inherent feeling of danger, than sitting in a hermetically sealed tube which is travelling several miles above the ground at an incredibly high speed. However airlines present it as something else. Airliners have subdued and relaxing lighting, they hide the nuts and bolts of construction and the necessarily thin pressure bearing walls of the aircraft by nicely decorated and smooth plastic mouldings. The staff speak in a reassuring and controlled manner so as not to alarm passengers. Aviation disaster movies (or anything else alarming) are not scheduled for in-flight entertainment. And what is happening for cycling ? While what ought to be done is to control the source of the danger, the motor vehicle, the emphasis is all to often placed on cyclists and pedestrians who are expected to behave and dress in ways which attempt to increase their own safety, generally marginally, in a hostile environment. It's the wrong approach because it does not attack the danger, nor the fear of danger head on. The way to increase both safety and subjective safety of cyclists is already known. I have more examples of things concerning subjective safety. To see what it's like to cycle without safety concerns, visit Assen. The photo at the top came from here. The title is that of a report by researchers from the Vrije Universiteit of Amsterdam. They looked at two new-build developments near Utrecht, Veldhuizen in Leidsche Rijn and Houten-Zuid (Houten itself being a largely new city, designed to be cycle friendly, as already discussed). These new developments are both still under construction, and both are further from the centre of a city making it more difficult to preserve a cycling culture due to journeys being longer. However, Houten-Zuid is judged to be much more cycle friendly than Veldhuizen. The investigation showed that in Veldhuizen, 33% of shopping was collected by bicycle, 13% of commuters travel by bike, and 56% of people take recreational rides. These figures might look quite good for most countries, but they're a little disappointing here. In Houten, the figures are 51% for shopping, 24% for commuting and 77% taking recreational rides. These figures need a little explanation. People who mix modes on their commute by cycling or walking in addition to taking public transport are not generally included in cycling figures in this country. To include them, add 9% and 14% respectively to the earlier commute figures. Also, sport cycling is excluded from the recreational figures. Residents of Houten-Zuid rate their cycle facilities higher than residents of Veldhuizen. What's more, many residents of Houten-Zuid give the cycle friendliness of the location as a reason why they chose to live there. Cycle friendly design results in an area being more highly valued by its inhabitants. 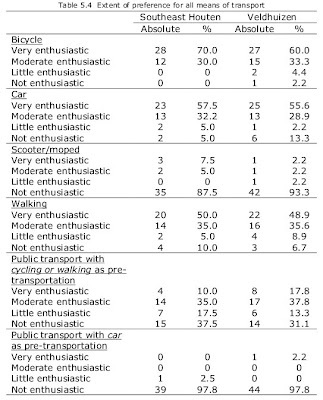 Perhaps the most interesting result for me personally is this one, showing the preference for different modes of transport. Having previously lived in a place in the UK where the local papers were always filled with letters from people complaining about cycles and cyclists, it is wonderful to see the overwhelming preference for bicycles of people living in both of these locations in the Netherlands. I take the complete lack of anti-cycling sentiment in our local paper as suggesting that people in Assen have similar views. Everyone appears to want to cycle, even if their circumstances currently make it difficult. As with anywhere else, where the conditions for cycling are better (as they are in Houten-Zuid), more people cycle. The photo and the report contents courtesy of the Fietsberaad - the Dutch cycling experts group. Their story on the report, in Dutch, is here. Assen has a similar Vinex wijk, Kloosterveen, which features on the Study Tours we organise in the Netherlands for people interested in cycling infrastructure. Here in the Netherlands it's not at that unusual for a household not to include a car. Adults without driving licenses are not particularly unusual. There are other practical ways to make journeys. These things are all relative, of course, and mostly I make my comparisons to the UK where I lived for most of my life. The UK also has quite a lot of households without cars. The figures for car ownership and affordability compared between the UK and the Netherlands make for interesting reading. Right up through the 1980s and early 1990s, The Netherlands had slightly higher car ownership than the UK, which was to be expected as cars were more easily affordable in The Netherlands than in the UK. However, in 1995 something changed. Car ownership here in the Netherlands stopped growing while it continued in the UK, surpassing the Dutch rate of ownership. The 1997 figure for car ownership in The Netherlands showed a slight reverse, with 372 per thousand compared with 373 in 1992. In 1994 in the UK, 30% of households were car free, and 11% were judged to be unable to afford a car. However, in The Netherlands, these figures were 42% and 7%, giving the widest gap between affordability and ownership amongst the EU15 in the table. The figures together indicate one thing. More Dutch people make a deliberate choice not to own a car than citizens of other countries in this survey. It's not that they can't afford to own a car, but that they have less of a need of it. By catering well for people who choose not to have a car, and creating an environment in which cycling is a very pleasant and efficient way of travelling, combined with good transport mode integration, an environment has been created where being car free is a more viable choice, both for families and individuals. However, you don't have to read far into this data to see that the car is still very popular in the Netherlands. Dutch people like driving, and they like cars. Cars remain more affordable in the Netherlands than in the UK. Lots of Dutch people own cars. However, Dutch people are not enslaved by cars. They have a choice of transport modes which work well, and the main alternative choice is the bicycle. Note that Dutch car ownership figures have risen considerably since the statistics used above were published. By 2010, the Dutch owned 528 cars per thousand people while the British owned 519 so again the Dutch own more cars than the British. Both countries have car ownership rates which are above average for Europe (see the Wikipedia list of countries by car ownership rate). However while they own plenty of cars, the Dutch are still opting to use them less than people of other European nations. The figures are from page 63 of a report titled "Are you moving in the right direction?" which was produced by the European Environment Agency back in February 2000. This article is one of many articles with interesting figures which you can find on our cycling articles page. Unfortunately it is the most recent set of comprehensive figures that I've found. 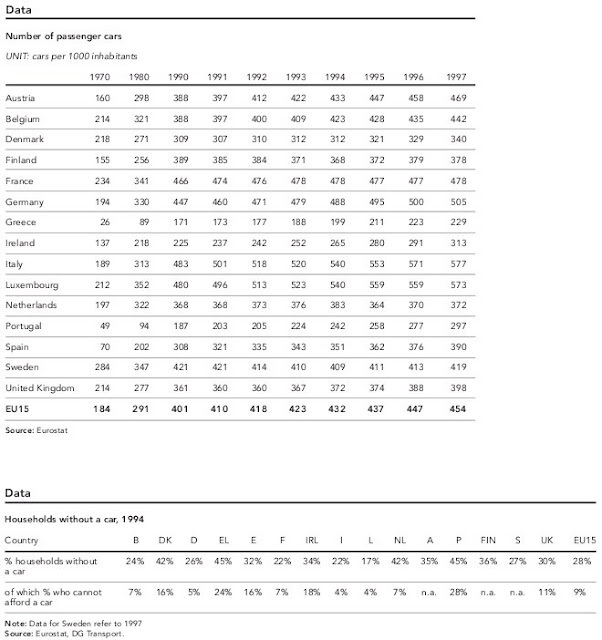 The fragmented figures I've found since then suggest a continuation on the same lines, though car ownership has grown all across Europe in the last ten years including in the Netherlands. The map of Assen on the left was part of the presentation given by the City Architect, Wybe Nauta, as a part of May's Study Tours. Note that each area of housing within the city is built with its own facilities so that everything is within walking and cycling distance. 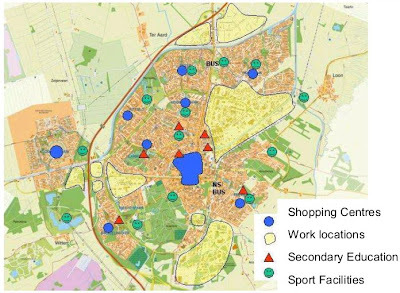 For instance, the blue areas show shops, which are spread throughout Assen, but note also the lack of out of town shops to compete with these and encourage driving. Primary schools are much more numerous than secondary schools and are not shown on this map. Everything is, of course, linked by a remarkably fine grid of high quality bicycle paths which makes the experience of collecting your shopping, or going to work or school or travelling to sport facilities an attractive activity without using a car. The level of subjective safety is always very high. The city is considered to be compact - the map shown covers an area which is barely more than 7 km from west to east - however, density is actually very low. It's different for villages. They have some shops, but people also make longer journeys to get to shops in the cities and these trips are also often made by bicycle. However, the facilities for them are of course first class, so routes to secondary schools, for instance, are well used, and well maintained. Where it has been made convenient and safe, as it is in the Netherlands, cycling is an attractive mode of transport. People cycle in the Netherlands for much the journey lengths and for much the same purposes as people drive cars in other countries (proven some years after this post when figures for journeys in London came to light). In many countries it is illegal to carry a passenger on a bike. Not here. Carrying a passenger on a bike is legal in this country, and very common. Those who've been doing this since childhood have a very relaxed way of hopping onto a friend's bike as the lights change, which is what you'll see in the video. A great way of transporting a friend who for some reason doesn't have their bike with them. It's worth pointing out that at this junction, as is always the case at well designed junctions in the Netherlands, when cyclists have a green light to go straight on, car drivers wishing to turn right have a red light. As such, there's no chance at all of a driver to your left running you over as you do this. "Let op! Voetgangers op fietspad" - "Look out! Pedestrians on the cycle-path". This situation is so unusual that this cycle-path has a unique sign to warn cyclists that pedestrians sometimes use this cycle-path in considerable numbers. This is the only one of these signs that I've ever seen in the Netherlands. I found it about 35 km east of my home. There have never been pedestrians on this cycle-path when I've ridden in this direction, but they are apparently quite numerous when there is a football match in progress. The local football stadium is to the right of the water; that's why pedestrians sometimes use this path. The Dutch don't build "shared use paths" where pedestrians and cyclists are expected to use the same space. It was made quite clear to us on the 2006 Study Tour just how much of a problem this caused in the one place in Den Haag where it was tried. The experiment has not been repeated. Remote cycle-paths in the countryside with very light use by pedestrians don't have separate walking paths, on these the few people who walk along them use the space in the same way as pedestrians walk on countryside roads without pedestrian paths in other countries. However, anywhere that there will be significant numbers of pedestrians, they're provided with a separate path so that there is no conflict with cyclists. Why does the UK persist in forcing pedestrians and cyclists to share, even though it continues to cause many problems ? One might have though that shared use paths being universally unpopular and the regular conflict caused by them might have made planners twig that this doesn't work, but shared use continues to be proposed and built. Pedestrians and cyclists are not the same. They do not have the same requirements. This simply causes conflict and unpleasantness. Occasionally it's even dangerous. So why does it continue ? Is it just cheapness ? It's obviously cheaper to build one path than two. When cycling is so undervalued as it is in the UK, perhaps the planners are oblivious to the deleterious effects of making cycling less appealing. It's quite obvious that they've not realised that if all effects are added together, providing for cycling costs less than not providing for cycling. Planning "Shared Use Paths" is a continuation of planning for very low cycle usage, rather than planning for cycling to grow. If you want cycling to grow, you need to provide space for cyclists. Low aspirations do not lead to growth because they do not provide for growth. To get growth you need properly segregated and good quality cycle paths which are not shared with pedestrians as well as properly designed segregation of modes without cycle-paths, which allow direct and convenient journeys to be made. That is what is found all across the Netherlands, with the exception of the spot where the photo was taken. Later blog posts expand more on the subject of Shared Use Paths. I'm always on the lookout for unusual signs, such as the equivalent of Cyclists Dismount, which I've still not found. I'm not generally a big fan of graffiti, but I thought this bit interesting. It's on a bridge support on the way into town, on a route which many cyclists pass daily. No doubt it was written by one of the many teenagers who go this way, on their bikes, to school. "Hi, sexbomb on the bike" - one of several messages written by someone trying to catch attention from someone else, while they cycle by. Everything happens on a bike. Perhaps it occasionally leads to scenes like the previous post. Many cyclists dread roundabouts due to the need to ride fast around them (hoping not to find the road slippery due to spilt diesel), be in the right lane etc. For some people, the need to use a roundabout on the road is good enough reason to cycle along a different route or to avoid cycling altogether. However, Dutch roundabouts don't cause these problems for cyclists due to being designed a little differently from those in the UK and most of the rest of the world. This design maximises subjective safety of cyclists. The photo shows a typical Dutch roundabout viewed from the air. Cyclists are not expected to use the road, but have a segregated cycle path which avoids the roundabout. Note that the central reservation on the road where the cycle path crosses is wide so that a cyclist only has to cross one stream of traffic at a time and can stop part way across the road. This choice of stopping is made by the cyclist, and is not forced when unnecessary by use of barriers. Also note that the crossing for cyclists is one car length removed from the roundabout itself, meaning that a driver can be stopped waiting to get onto the roundabout without blocking cyclists who are crossing. On some roundabouts, motorists must give way to cyclists crossing the arms of the roundabout, though that is not shown on this photo nor the accompanying video which shows a similar roundabout in use here in Assen. Despite this lack of priority, from personal experience I find it is rare that one has to do more than slow a little at these locations. Note how the children ahead of me negotiate the roundabout efficiently, just regulating their speed a little to synchronize with a car coming from the right. I have to slow a little to synchronize with a passing car from the left. It is rare that you have to stop completely. In addition to the features of the roundabout which are concerned with cyclists, there are also other differences from the British style of roundabout. Note that there is only a single lane of traffic going around the roundabout rather than multiple lanes, and also that the cars entering and leaving the roundabout have to turn quite sharply to do so. This reduces speeds on the roundabout and increases safety. It is also quite common for cyclists to avoid roundabouts in other ways, such as by using underpasses, so that they're barely aware that the roundabout exists at all. 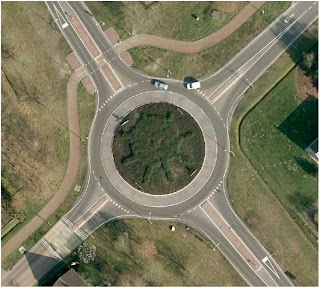 Read more about the safest designs for roundabouts in the Netherlands. There are now many posts on this blog about roundabouts. Please click to read them all. The photo comes from a presentation given by Wybe Nauta on the May 2008 Study Tour. Most people recognise that there are good reasons to try to reduce the proportion of journeys made by driving. There are many things out there which may may look initially like a good idea to help to achieve this, but most are simply distractions. One high-tech device that occasionally gets a bit of publicity is the Segway. It travels at the speed of a slow cyclist over a distance that anyone can cover on a bike, and it's expensive. However, it's championed by some as a "breakthrough". So, what's not to like ? There's no-where to put any luggage or shopping except in a rucksack or other bag on the person. It's slow compared with a bicycle. Just 20 km/h (12.5 mph) maximum speed. It's very heavy to lift (around 50 kg) if you should need to move it. So forget carrying it onto a train, for instance. It uses batteries which will at some stage have to be disposed of or recycled. It is utterly dead in the water if the battery runs out as you're riding it. It costs... HOW MUCH ? And that cost is of course a complete killer. $5,350 to $6,400 in the US plus another $1600 or so every 2 to 3 years when the battery needs replacing. Are you going to buy one for each of your children to ride to school ? I've tried the Segway. It's a very neat device, technically clever and as easy to control as its promoters say. I didn't fall of it like George Bush did. I also think the developers did very well to produce it at all. However, that doesn't get over the basic pointlessness of the device. A bicycle is more useful in every way. The Guardian writes about Fiat supporting a competition which picked a modified snowboard with handlebars as a good transportation alternative. They suggest that a skateboard would be a better alternative. It sometimes seems anything is to be considered in place of the already existing and proven bicycle. I've nothing against horses, segways, snowboards, nor the people who ride any of these things. However, they are all examples of distraction technologies. Things that are promoted as ideal forms of transport when they are not, and when the truly practical alternative - the bicycle - is ignored by the British press, even though they're susceptible to reproducing the most preposterous green wash. Even over emphasis on cycle training is missing the point. The reason that people don't cycle is that cycling feels unsafe. It is also viewed as inconvenient. If you really want to increase the rate of cycling, you need to tackle these problems directly by increasing subjective safety and directness so that people find cycling an attractive means of transport. 8th April 2009 update. Here's another example. I also recently wrote about over-reliance on the price of fuel. Update 2014: This stuff just keeps on coming. 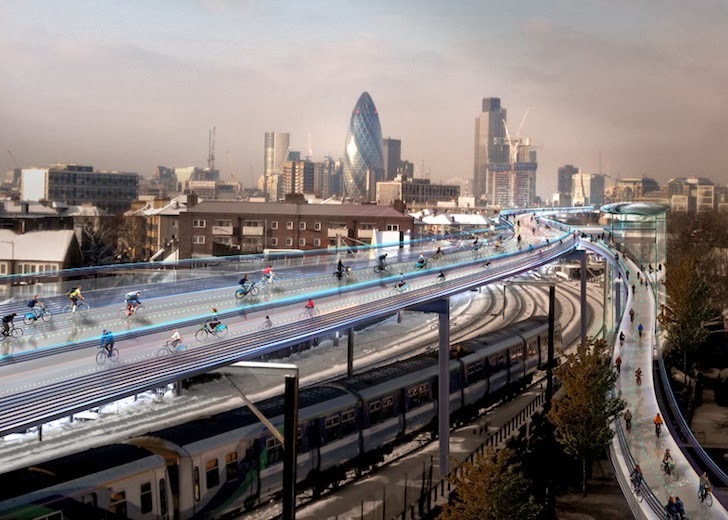 There's now a proposal for London to have "Skycycle", a network of cycle-paths built in the sky. This is a proposal for a very sparse network (220 km in total, about the same as the length of cycle-paths in Assen, but London's population is more than 100x as large) which won't go near most homes or most destinations. It's another distraction from what is really needed. Luckily, it's crazy enough that it'll probably never be built. However, it will waste time, and London really does not have time to waste. The picture at the top is of another, older, distraction technology: The "Bicycle Railroad". This was a late 19th century idea of a pedal powered monorail, which come back time and time again. This example is in the Velorama bicycle museum.